You know how most kids’ toys are kinda boring for adults? As much as we love engaging in play with our little ones, there are certain toys that are obviously (and correctly) created for the development and enjoyment of the youngest minds only. Playable ART balls, however, are one toy we definitely see getting some after-hours playtime from us. 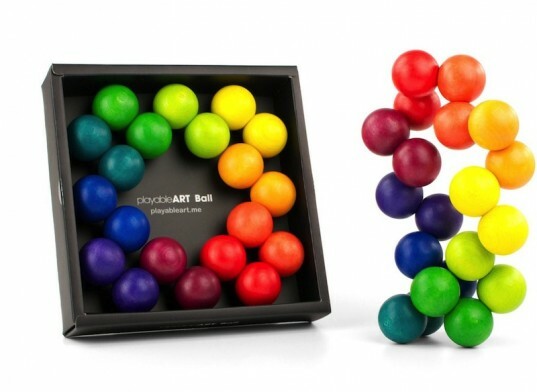 The twenty interconnected balls are made from FSC-certified beechwood and come in 10 eye-popping rainbow colors. And because their connection is pliable, there’s a plethora of ways these balls can be arranged -- from simple triangles to bowl shapes or manipulated into wave or stacked shapes. We can already see this funky toy adorning our coffee table, being fought over for some active, hands-on play during long car rides, or make waiting for dinner a much more pleasant and artistic experience! The balls are painted with non-toxic, water based paint and the connectors are made from phthalate-free plastic. Playable ART balls, however, are one toy we definitely see getting some after-hours playtime from us. 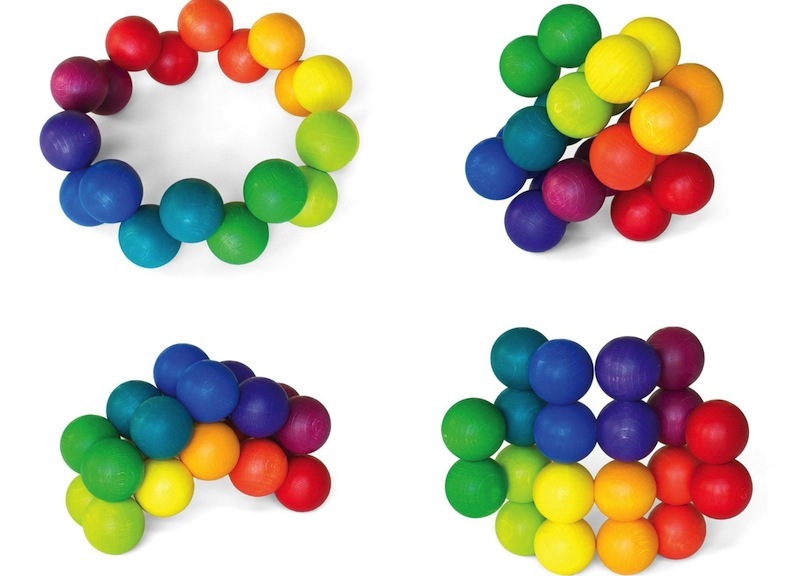 The twenty interconnected balls are made from FSC-certified beechwood and come in 10 eye-popping rainbow colors. And because their connection is pliable, there’s a plethora of ways these balls can be arranged -- from simple triangles to bowl shapes or manipulated into wave or stacked shapes. We can already see this funky toy adorning our coffee table, being fought over for some active, hands-on play during long car rides, or make waiting for dinner a much more pleasant and artistic experience! The balls are painted with non-toxic, water based paint and the connectors are made from phthalate-free plastic.